Oooooh. The Mavericks have a new single out. I know, it's not My Music Monday. It's not a full recording, so not a Record of the Month post either, but you have to read this entry......to the end. Per their PR firm - or something / someone like that - "the song was used in a short film released by the government as a racism public service announcement in 1945. The band thought that it really related to today’s political atmosphere." They also go on to say that the song is to be released before the political conventions, and until then it's existence is supposed to be "hush hush". Since 'conventions' was plural, in theory the song would have to be released before the GOP convention. I mean, it stands to reason. It seems it got released between the two. And while I haven't heard this version of the song in advance, I did go sample others - and it has been covered a LOT. Sinatra. Cooke. Danza. Oh yes. The incomparable Tony Danza. Frank might be the Chairman of the Board, but Tony is the Boss. Oh, who are we kidding - that was always Mona. Oddly enough, I'm blogging about the Mavericks, but I'm not really. I'm really blogging about the cover art. My cousin David took the photograph for the artwork. I believe he took it at his father-in-law's house in Iowa. My first thought was: well, there are no single sleeves anymore....since there are no singles. But then I guess each selection in the iTunes has an image, so.....why not? I'm always proud of David, but I love that he got this opportunity. As the Mavericks are pretty much self-releasing their stuff now - which is possibly the only way to make money in that industry, unless it's touring and merchandise - it's unknown what kind of reach they'll have. I got a live version of the song, which kind of sounds familiar, but kind of sounds like another song on to which I cannot place my finger. I agree it has a patriotic bent to it. Perhaps a little heavy-handed, but maybe the message is what this country truly needs right about now. Congrats to David for a new market to his career. 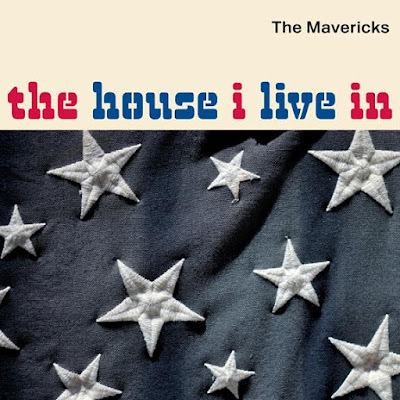 the mavericks - I have seen them in person several times, in both large venues and intimate clubs. who WOULDN'T love raul malo's voice? but my fave cutie in the band is robert, the bass player.